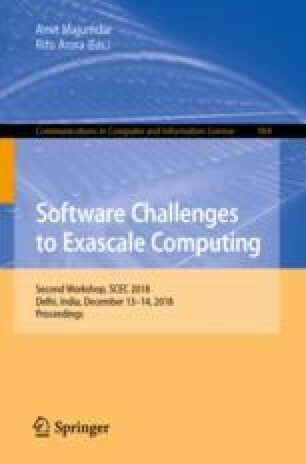 There is a growing demand for supercomputers that can support memory-intensive applications to solve large-scale problems from various domains. Novel supercomputers with fast and complex memory subsystems are being provisioned to meet this demand. While complex and deep-memory hierarchies offer increased memory-bandwidth they can also introduce additional latency. Optimizing the memory usage of the applications is required to improve performance. However, this can be an effort-intensive and a time-consuming activity if done entirely manually. Hence, high-level approaches for supporting the memory-management and memory-optimization on modern supercomputers are needed. Such scalable approaches can contribute towards supporting the users at the open-science data centers - mostly domain scientists and students - in their code modernization efforts. In this paper, we present a memory management and optimization workflow based on high-level tools. While the workflow can be generalized for supercomputers with different architectures, we demonstrate its usage on the Stampede2 system at the Texas Advanced Computing Center that contains both Intel Knights Landing and Intel Xeon processors, and each Knights Landing node offers both DDR4 and MCDRAM. We are very grateful to the National Science Foundation for grant #1642396, ICERT REU program (National Science Foundation grant #1359304), XSEDE (National Science Foundation grant #ACI-1053575), and Texas Advanced Computing Center (TACC) for providing resources required for this project. We are grateful to Tiffany Connors and Lars Koesterke for their contributions to the ICAT codebase. Stampede2 is generously funded by the National Science Foundation (NSF) through award ACI-1540931.